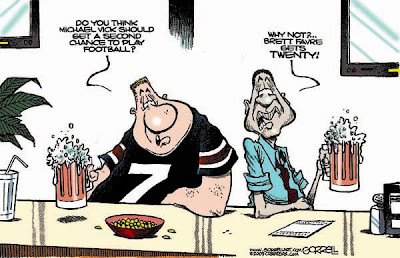 Heh, heh, tho' I no longer follow sports, I kept track of these two( I know it doesn't make any sense...I blame the media, of course )...the one cartoon could be Terry Bradshaw-LOL! 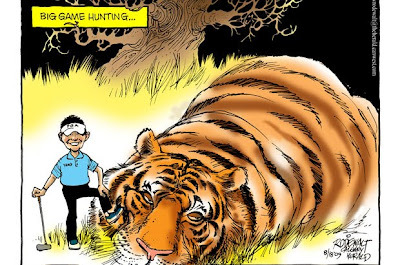 The cartoonists always have SOMETHING. I shook my head in seeing Favre in a walker though. He's such a great guy, but I don't think he should be allowed to go in and out of a contract by retiring and then coming back. I am very upset with football right now. 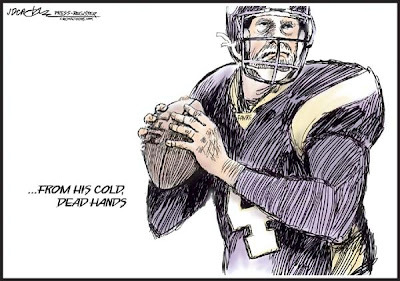 Favre is an egomaniac, but I'm more upset about Vick being allowed back into the NFL and even more upset that the Eagles signed him. I am now a FORMER Eagles fan. subtorp77: I know. Is this pro football or a soap opera? 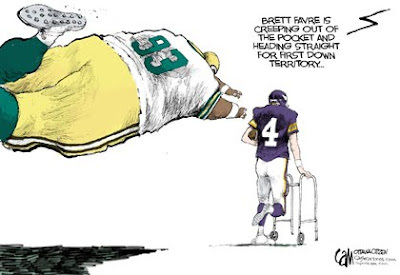 dizzblnd: I think the cartoons are spot on the money, especially the ones with the walker. Funny stuff. John: It sure sets a precedent, the Vick case. Who you pulling for now? 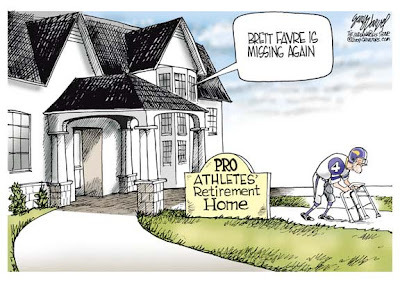 Favre, needs to stay in the nursing home. Of course if teams are willing to pay him, who can blame him. 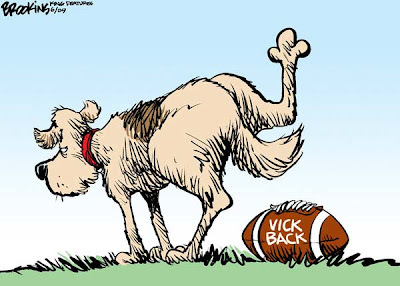 I think every time Vick shows his face a tape should play next to him showing dogs fighting for their life. Just as a reminder of who he is. noname, it must be a soap; why else would Mom scream at the telly( when her team is losin' )?-HA! Come to think of it, she yells at pretty much everything on the telly-LOL! ettarose: Don't hold back. Tell us how you really feel! subtorp77: I like your mom, already. Nooter: Of course. The dog has the upper hand, er, ah, leg. I remember when he tried sports announcing. He told them right then and there that he hated it and that he wouldn't be back. At least most of us have more than one thing we're good at. Ms 30? Hey how are ya? Where ya been hiding? That's an interesting perspective. But ya don't think he's made enough money yet? noname, HA! Just don't slam her team-LOL! I got an earful( more than once )...oofah! 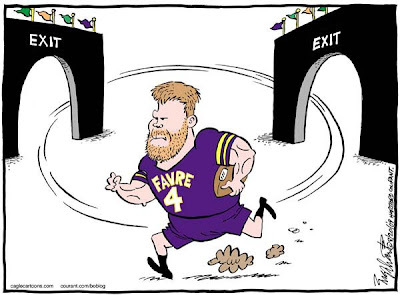 Hey, come on, Favre did really well in his debut as a Viking. He completed one pass out of four for four yards. I don't think many senior citizens can do that? Unless they swam in that swimming pool from the movie Cocoon. subtorp77: I'll take your word on that. lotgk: Personally I think the interesting team to watch this year is gonna be Philly.